Since the sidewalls of radial tires are thinner, they can be damaged by mounting some types of snow chains on them. Therefore, the use of snow tires is recommended instead of snow chains. Do not mount tire chains on vehicles equipped with aluminum wheels; snow chains may cause damage to the wheels. 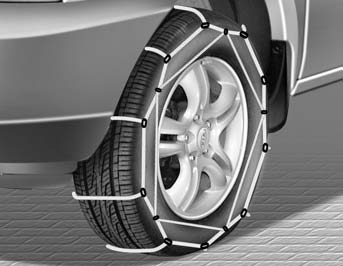 If snow chains must be used, use wire-type chains with a thickness of less than 15 mm (0.59 in). Damage to your vehicle caused by improper snow chain use is not covered by your vehicle manufacturers warranty. Make sure the snow chains are the correct size and type for your tires. Incorrect snow chains can cause damage to the vehicle body and suspension and may not be covered by your vehicle manufacturer warranty. The snow chain connecting hooks may be damaged from contacting vehicle components causing the snow chains to come loose from the tire. Make sure the snow chains are SAE class “S” certified. When mounting snow chains, park the vehicle on level ground away from traffic. Turn on the vehicle Hazard Warning flashers and place a triangular emergency warning device behind the vehicle if available.